A pro-Andrew Jackson political cartoon applauds the president's September 1833 order for the removal of federal deposits from the Bank of the United States. 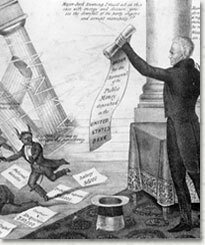 On the right, Jackson, cheered on by Major Jack Downing, holds aloft a scroll with the words "Order for the Removal of Public Money." To the left, the combined opposition to the president's move -- represented by Bank President Nicholas Biddle, Whig Senators Daniel Webster and Henry Clay, and the pro-Bank press -- are ridiculed. In McCulloch v. Maryland (1819) the Supreme Court ruled that Congress had implied powers under the Necessary and Proper Clause of Article I, Section 8 of the Constitution to create the Second Bank of the United States and that the state of Maryland lacked the power to tax the Bank. Arguably Chief Justice John Marshall's finest opinion, McCulloch not only gave Congress broad discretionary power to implement the enumerated powers, but also repudiated, in ringing language, the radical states' rights arguments presented by counsel for Maryland. At issue in the case was the constitutionality of the act of Congress chartering the Second Bank of the United States (BUS) in 1816. Although the Bank was controlled by private stockholders, it was the depository of federal funds. In addition, it had the authority to issue notes that, along with the notes of states' banks, circulated as legal tender. In return for its privileged position, the Bank agreed to loan the federal government money in lieu of taxes. State banks looked on the BUS as a competitor and resented its privileged position. When state banks began to fail in the depression of 1818, they blamed their troubles on the Bank. One such state was Maryland, which imposed a hefty tax on "any bank not chartered within the state." The Bank of the United States was the only bank not chartered within the state. When the Bank's Baltimore branch refused to pay the tax, Maryland sued James McCulloch, cashier of the branch, for collection of the debt. McCulloch responded that the tax was unconstitutional. A state court ruled for Maryland, and the court of appeals affirmed. McCulloch appealed to the U.S. Supreme Court, which reviewed the case in 1819. In a unanimous opinion written by Chief Justice Marshall, the Court ruled that the Bank of the United States was constitutional and that the Maryland tax was unconstitutional. Concerning the power of Congress to charter a bank, the Court turned to the Necessary and Proper Clause of Article I, Section 8, which expressly grants Congress the power to pass laws "necessary and proper" for the execution of its "enumerated powers." The enumerated powers of Congress include the power to regulate interstate commerce, collect taxes, and borrow money. Said the Court famously, "let the ends be legitimate, let it be within the scope of the constitution, and all means which are appropriate, which are plainly adopted to that end, which are not prohibited, but consist with the letter and spirit of the constitution, are constitutional." In other words, because the creation of the Bank was appropriately related to Congress's legitimate power to tax, borrow, and regulate interstate commerce, the Bank was constitutional under the Necessary and Proper Clause. Second, the Court ruled that Maryland lacked the power to tax the Bank because, pursuant to the Supremacy Clause of Article VI of the Constitution, the laws of the United States trump conflicting state laws. As Marshall put it, "the government of the Union, though limited in its powers, is supreme within its sphere of action, and its laws, when made in pursuance of the constitution, form the supreme law of the land." Because "the power to tax is the power to destroy," Maryland was unconstitutionally undermining the superior laws and institutions of the United States. Finally, the Court held that the "sovereignty" (political authority) of the Union lies with the people of the United States, not with the individual states that comprise it. The United States, not a simple alliance of states, is a nation of "constitutional sovereignty" with its authority resting exclusively with "the people" who created and are governed by the Constitution. To the Court, "the government of the Union is a government of the people; it emanates from them; its powers are granted by them; and are to be exercised directly on them, and for their benefit." Maryland's tax, however, violated constitutional sovereignty because it acted as a levy against all the people in the United States by a state accountable to only some of the people. If Marbury v. Madison (1803) "promised" that the Supreme Court would exercise great authority in shaping the laws of the land, McCulloch v. Maryland fulfilled that promise for the first time. Arguably no other decision has so profoundly defined national power. In one case, the Court expanded Congress' powers to include those implied by the Constitution, established the inferior status of the states in relation to the Union, and set the constitutional sovereignty of the federal government. McCulloch remains today a fundamental and binding bedrock of American constitutional law.